It's no wonder plants around the world rely on the convenience, versatility and rugged performance of our floor-level palletizers. Our modular designs adapt to match your space and product flow. The convenience offered by the floor level infeed, the standard category 3 safety features and the Easy To Operate Product Manager software package are unmatched in the industry. Economical. Compact Footprint. Easy to Operate. FL1000 floor level palletizer is available as a semi-automatic or fully automatic palletizer. With a heavy-duty formed and welded frame, 80-pitch hoist chain, Category 3 safety system and Product Manager software, it’s built to last and easy to operate. FL1000 stacking a variety of cases sizes and weights. Columbia's FL1000 Floor Level Palletizer stacking cases of beer. 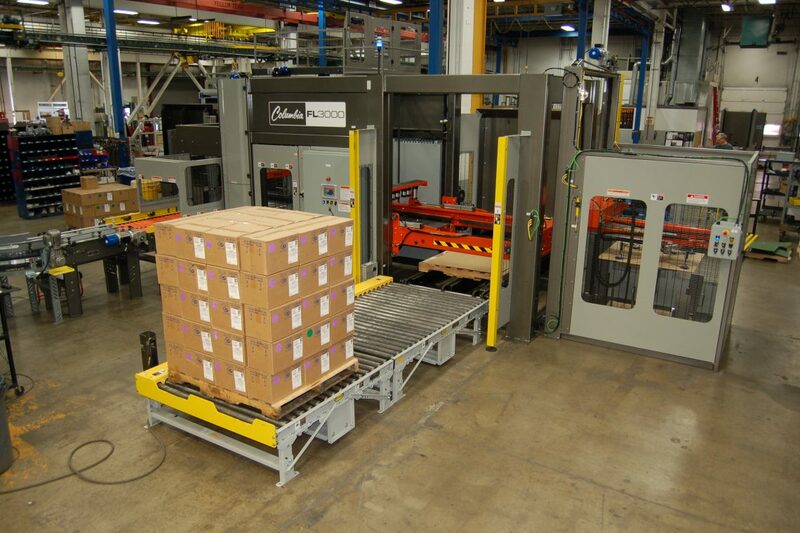 Columbia's FL1000 Floor Level Palletizer operating with manual pallet placement. 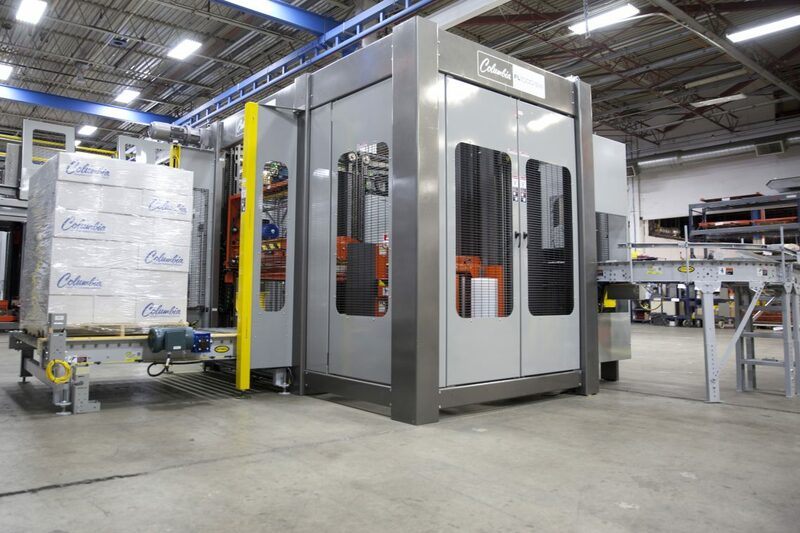 FL1000-SW combines a heavy-duty small footprint palletizer with a fully integrated stretch wrapper. The FL1000-SW simultaneously stacks and stretch-wraps a variety of package types including cases, trays, shrink bundles, display packs and more. 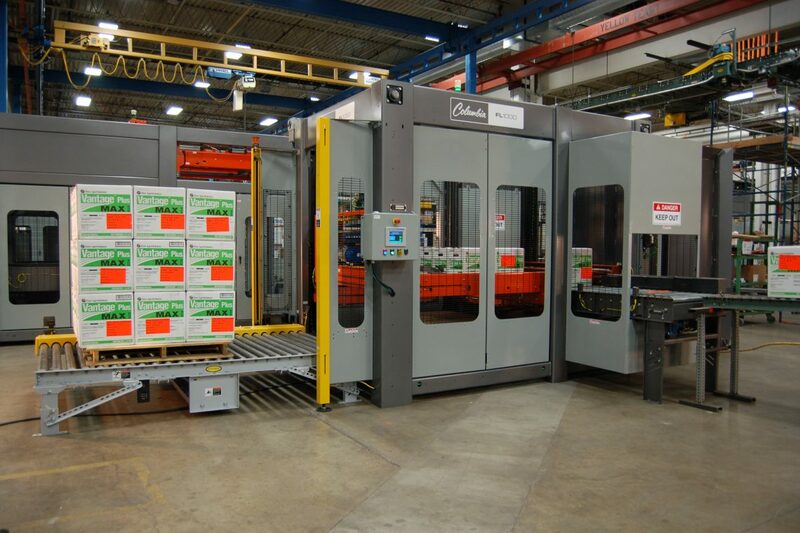 Columbia's FL1000SW Floor Level Palletizer stacking a variety of package types and simultaneously stretch wrapping the load. See how easy it is to load film into the stretch wrapper. Watch the FL1000SW stack shrink bundles and trays of bottled water. Flexible Layouts. Easy to Maintain. FL2000 features a smooth operation, category 3 safety system and a heavy-duty formed steel construction available in various layouts and is built to last. FL2000 palletizer stacking small cases. FL2000 stacks plastic totes 6 layers high. Watch the FL2000 stack a variety of package types and sizes. FL3000 is an enhanced version of the FL2000 with the added performance featuring a full layer table. Watch the FL3000 stack cases, paint bundles, cases of milk and more. Watch the FL3000 stacking bundles of paint in an interlocking pattern. Watch the FL3000 use a secondary squeeze to assist crates with nesting. The revolutionary design of the FL6200 features a servo operated layer transfer hoist to provide the ultimate throughput in floor level palletizers. Watch the Pack Expo 2016 interview on the FL6200 high speed, floor level palletizer. 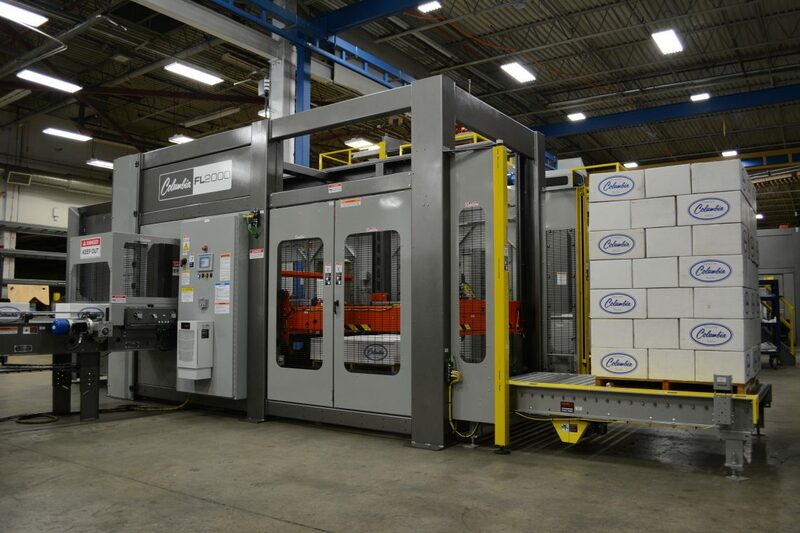 Watch the FL6200 high speed floor level palletizer stacking cases. 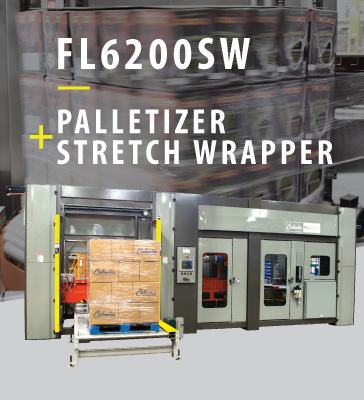 The FL6200SW combines high-speed stretch wrap technology with a contemporary, modular and clean design palletizer that is extremely user-friendly. The integrated stretch wrapper helps when load stability or space constraints are an issue. 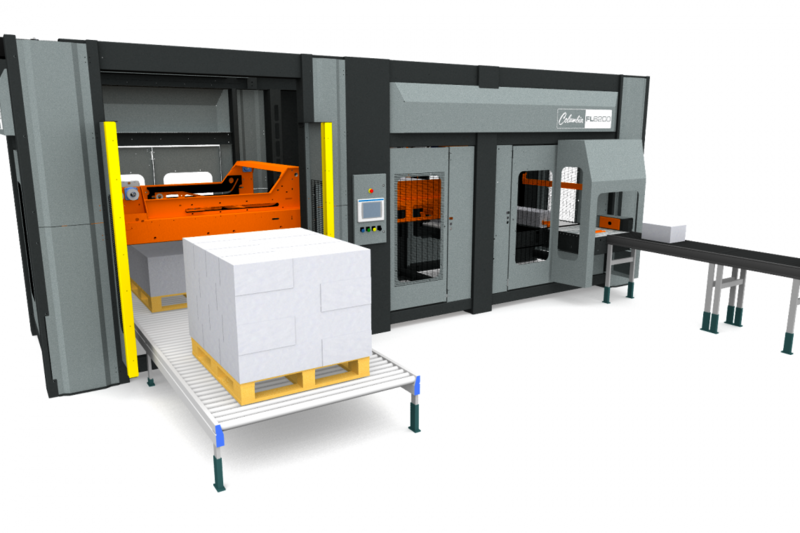 The FL6200SW high-speed, floor level palletizer includes a fully integrated stretch wrapper and an OTTO™ 1500 SDV for removing the full pallet load. Ted Yeigh was interviewed by Packaging World during the Pack Expo Show where Columbia demonstrated the NEW FL6200SW high-speed, floor level palletizer including a fully integrated stretch wrapper and OTTO 1500 SDV. 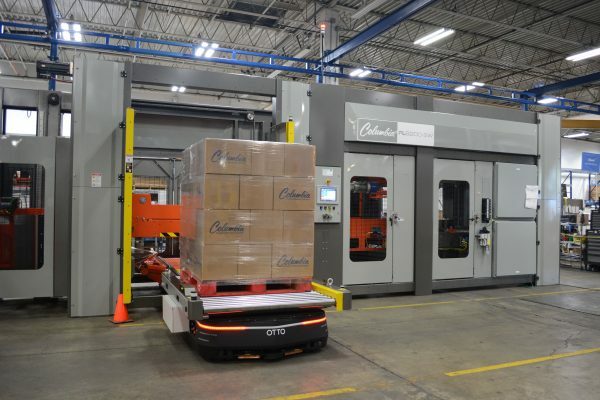 Columbia’s floor level palletizers are available in countless layout possibilities and provide consistent performance from one to over 100 cases per minute. WHAT IS A FLOOR LEVEL PALLETIZER MACHINE? Floor level palletizer machines have an infeed entry level of approximately 36" and a typical pallet discharge conveyor elevation of 18". Floor level palletizers, when compared to high level palletizers, are generally lower in cost and provide easier access to the entire machine.